The Greek king Admetus was the son of Pheres, the king who had founded Pherae, and of Periclymene. He was a very pious and right person. He took part in the hunt of the Calydonian boar. He is also well-known because god Apollo was his servant for one year. But how come a mortal had such a great honour? In brief, the story goes like this: Apollo had a son, Asclepius, who was a gifted healer (and who was later considered the god of medicine). Asclepius managed to raise people form the dead, and Zeus punished him, by striking him dead with a thunderbolt. Apollo couldn't do anything against his own father, and so he killed the Cyclops who had manufactured Zeus' lightning bolts. That's why he was punished to be a mortal's servant. Admetus was hospitable and he treated everyone well and with justice, that's why Apollo helped him many times. While he was a herdsman, he made all the cows bear twins and alle the goats to have plenty of milk (this shows us that the god was a protector of the cattle). King Admetus fell in love with Alcestis, the daughter of Pelias (who was Admetus' uncle). But king Pelias asked the suitors a seemingly impossible task: to yoke together a lion and a boar to a car. Apollo yoked the two animals and Admetus brought them to Pelias, and thus he got the hand of the beautiful Alcestis. For his marriage, Admetus performed sacrifices, but he forgot to sacrifice to Artemis. That's why, when the newlyweds entered the nuptial room, they found it full of serpents. Apollo had to plead with his sister to make the serpents disappear and finally she did, after Admetus brought sacrifices to her, too. Apollo also tricked the Moirai into changing Admetus' fate: when the time for his death came, he could escape death, if he managed to find someone in his family willing to take his place. And so, when Thanatos came for king Admetus, he went to his mom and dad and asked them to die instead of him (I imagine he politely asked them, "You're old anyway, now wouldn't it be a great idea if one of you volunteered to die instead of me?"). But they both turned him down, as life was way to sweet for them to die before their time. There was one person, though, who accepted to die: it was his loving wife, Alcestis, who didn't want her children to remain without a father. Now, according to you, what would a hero do, someone who would take part later in the Calydonian boar hunt and in the Argonauts' expedition? Would he let a woman sacrifice herself, or would he manly accept his fate? Well, he manly accepted... her sacrifice. 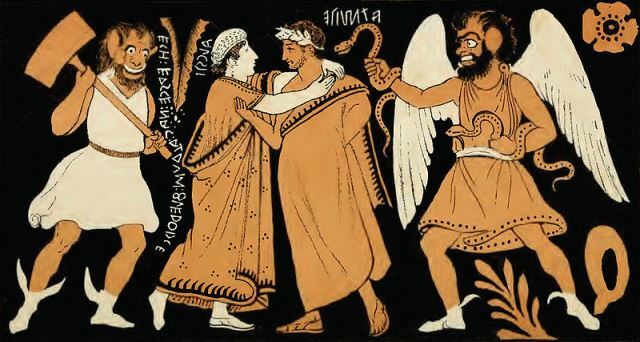 In Euripides play Alcestis, Admetus promised his wife that he wouldn't marry again and that he would give up merrymaking. It so happened that, the day his wife died, Heracles came to visit the king. That's why he ordered everyone to keep Alcestis' death a secret, so that the guest would not be troubled with the sad news. Heracles got pretty drunk and didn't behave himself, and one of the servants snapped at him. When the mighty hero heard the truth, he went to Alcestis' tomb, wrestled Thanatos and managed to bring Alcestis back to life. Admetus and Alcestis had a son, Eumelus (who was one of Helen of Troy's suitors and took part in the Trojan war) and a daughter, Perimele. Some people say that king Admetus and Alcestis' love story is so romantic and beautiful, but I just see a selfish and coward king. What do you think about that? Farewell of Admetus and Alcestis - Etruscan red-figure amphora, Vulci.